The MG Car Company was plunged into turmoil early in 1935 when William Morris sold MG to Morris Motors which formed the major part of the Nuffield Organisation. The organisation was primarily set up to rationalise Morris's sprawling business concerns and in the interests better efficiency allied to cost savings. Now known by the title of Lord Nuffield, it was well known that he personally disliked motor sport and it was in this area particularly that MG suffered most. Morris's new managing director, Leonard Lord was charged with streamlining the Nuffield empire and it was he who Cecil Kimber now became answerable. At a stroke MG's racing programme was cut midway through the 1935 season in the interests of reducing costs and this came as a severe blow to Kimber who up until then had virtually a free hand in development of racing vehicles and the everyday road cars. With the acquisition by Morris, Kimber was instructed to return far higher profits and the new management installed by Morris were solely interested in profitability related to simplicity and commonality of parts throughout the Nuffield range. With these new directives the Wolseley range of overhead camshaft engines ceased which immediately spelt the end for the MG PA/PB models and the Magnette. Kimbers biggest shock in all this reorganisation was the closure of the Abingdon design office with an enforced move by the team to the Morris design office at Cowley. H.N. Charles, Kimber's chief designer, now resident at Cowley was promptly put to task on the design of a new range of MG models, the first of which was to be the beginning of the T series, the TA Midget, which was launched at the latter end of 1935. The model that really caused a stir, both in the motoring press and amongst enthusiasts was the all-new Two Litre model designated the SA Type. Launched in October 1935 it was a completely different breed of MG and was regarded by many as a belated successor to the 18/80 series which had ended production nearly four years previously. 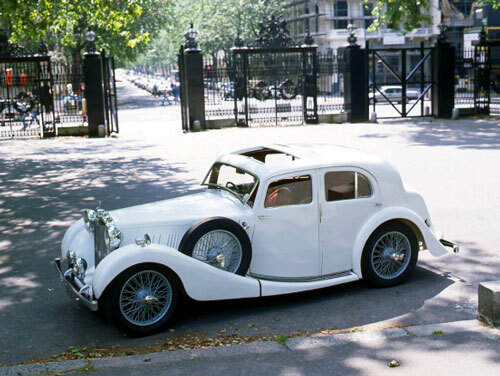 It was certainly a large car by MG standards, weighing in at over 30 cwts and exceeding 16 feet in length, nonetheless it had graceful lines and was designed to compete with other similar offerings such as the Jaguar SS 2.5 litre saloon. Due to production delays caused mainly by inflexibility within the Nuffield group, the MG saloon was at least six months in the making and as a result the impact of the initial launch publicity was totally lost. There were many dissatisfied customers waiting for their cars and a lot of them deserted MG in favour of the Jaguar. There were many production changes along the way in a bid by Abingdon to keep up with the competition and as a result of supply problems of componentswithin the Nuffield group. Purists could not come to terms with this luxury MG conveyance due to its sheer size allied to pedestrian performance. It was undoubtably a quality vehicle however, which was refined and elegant and found its own niche in the market due to its extremely competitive price of £375. More disdain amongst the purist was evident on the launch of the smaller stable mate the VA or one and a half litre as it became known. Introduced in time for the 1936 Motor Show, primarily as a replacement for the N type Magnette, it looked like a scaled down version of the SA. In keeping with the SA the new car was available as a saloon, an open tourer or as a coachbuilt Tickford convertible and they were priced at £325, £280 and £335 respectively. The VA was a neat well proportioned car and was distinguishable from its larger brother by the front nearside wing-mounted spare wheel. Built on a conventional and sturdy MG chassis that was unique to the VA, the car had a 9' 0" wheelbase and was 14' 3" long. The main chassis side members were of box channel construction and swept up at the rear over the rear axle line to accommodate a softer rear suspension arrangement and to allow greater vertical wheel movement. Although the chassis was unique to the VA, other components such as the front and rear axles were shared with the Morris 12/4 and Wolseley 12/48. Lockheed hydraulic brakes with 10" drums were fitted to the VA unlike its predecessor the N type Magnette that had a cable operated system. The power unit was a pushrod overhead valve type of 1548 cc and was common, with slight variation in the TA Midget, the Wolseley 12/48 and the Morris 12/4. The VA version had twin semi-downdraught SU carburettors and a bore and stroke of 69.5 mm x 102 mm with a power output of 54 bhp @ 4,500 rpm. The weight of the car, nearly 23 cwts precluded any meaningful performance, but nonetheless the MG was no slow coach with the saloon and convertible returning a top speed of over 75 mph and the tourer managing nearly 82 mph with the windscreen folded down flat. Transfer of power to the road wheels was via a cork clutch running in oil through a Nuffield four speed gearbox to a spiral bevel rear axle. A neat remote gear change was standard on the VA and it was the first time in an MG saloon that a part synchromesh gearbox had been employed. Sadly the VA suffered the same fate as the SA in as much as it took at least six months to get the car into full production after its official launch and it also suffered many component specification changes through its production life. The cork/oil clutch was changed for a dry plate variety, the carburettors, shock absorbers, road springs, rear axle casing, steering box and even the door handles were changed. In the engine department the camshaft was altered twice and white metalled big end shells gave way to bearings. It seemed that nearly all the components that comprised the VA were at some time either modified or changed which made life very difficult on the production line for the Abingdon workers. Despite all the interruptions the car did sell well during its two year production run with a total of 2,407 all variants leaving the factory gates prior to the outbreak of war. The 4 door saloon sold particularly well at £325 and had such refinements as a Bluemel adjustable steering wheel and Luvax dashboard damper control. There was also an option of the Smiths Jackall built-in hydraulic jacking system. Bore & Stroke: 69,5mm x 102mm. Valve Gear: Overhead valves operated by pushrods. Carburation: Twin semi-downdraught SU HV5. RAC rating: 12hp. Max Power: 54 bhp @ 4,500 rpm. Gearbox: 4 speed manual with synchro-mesh on 3rd and top. Clutch: Initially single plate cork in oil, later single dry plate. Final Drive: Spiral bevel rigid axle. Brakes: Lockheed hydraulic 10" drums all round. Suspension: Semi elliptic front and rear with anti-roll shackles. Hydraulic adjustable shock absorbers. Wheels & Tyres: 5.00 x 19" centre lock wire spoke. Wheelbase: 9'0". Length: 14'3". Width: 5'2".